To mid to large sized construction companies in the alternative energy industry, we can be the single source for all labeling needs for solar, wind, and nuclear energy plant construction and maintenance. With over 20 years experience, Advanced Graphic Engraving understands the need for ultra-durable products that will survive the harshest conditions. By choosing Advanced Graphic Engraving as your label supplier, you are choosing experience, saving your time and budget, and receiving a team dedicated to producing your project to completion. Showcasing the most frequently purchased products by leaders in the Alternative Energy Industry. 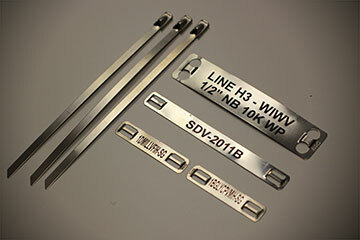 We use high quality Rowmark engravable plastics that are UV stable and suitable for exterior use. 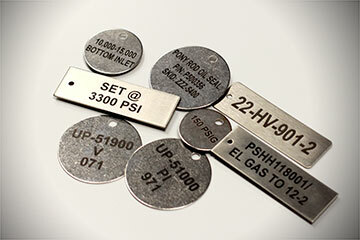 Tags can be either surface or reverse engraved, with a matte, glossy, or textured finish. They are available in most colors, and sized up to 24″ x 48″ at either 1/16″ or 1/8″ thickness. The shapes, corners, and mounting holes on the product are nearly limitless and customized to your specifications. This material can be rotary engraved or laser etched to your specifications. To mount your photovoltaic tags, we provide a 3M™ adhesive. This urethane foam tape is 1/32″ thick and features a high-shear acrylic adhesive with a high temperature resistance for use in extreme conditions. Advanced Graphic Engraving provides valve and relay graphics for alternative energy solutions for Siemens Industry. 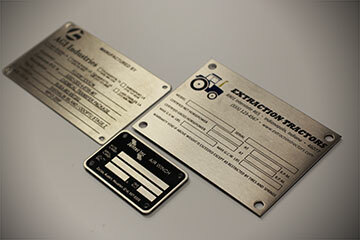 Advanced Graphic Engraving manufactured laser etched stainless steel data plates for use in green energy trash compactors. Advanced Graphic Engraving manufactures arc flash labeling for one of Entergy’s nuclear power plants. Here is what our Alternative Energy customers have to say about our work.